Navigate where you want to install/update PocketMine-MP. At the moment, only jailbroken iOS devices can run PocketMine-MP. Put no limits to your imagination. Control all aspects of gameplay. Play on multiple worlds, for free. To set up a server, you need a supported device. In the folder where PocketMine-MP has been installed, open the server.properties file with a normal text editor. You can check all the settings and their values on the server.properties page on the Wiki. If you are setting up PocketMine-MP on a home network, you have to port forward the PocketMine-MP UDP (and TCP if using RCON) port on your router. If you don't know how to do port-forwarding, go to Port Forward, search your router, and follow the instructions. To extend the features of PocketMine-MP, you can add Plugins to get new features, or modify already existent ones. Before asking anything, you should read the Frequently Asked Questions page and the Wiki. That should solve the majority of the questions. Github Issues: Report bugs, send improvements or new features. Forums: Join the community, ask questions, search for plugins. IRC: Direct chat. 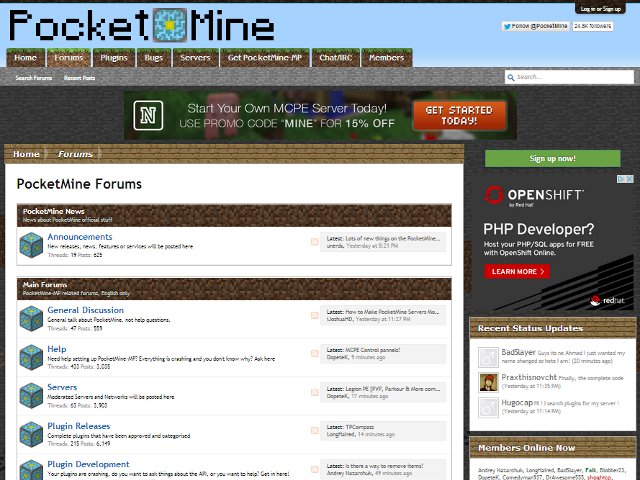 #pocketmine (or #mcpedevs) @ irc.freenode.net, or use the WebIRC. Direct E-Mail: Contact at [email protected], [email protected], [email protected], [email protected] Only urgent things, for normal questions use one of the methods above. Irrelevant messages will be deleted. Extend the game in the way you want, add awesome features. Teleport players, whitelist your server, tune the server, Remote Console. Get all your friends in one server. Or run a public server. Endless features, and we continuously implement new things. Disables flying, item hack, running & more. With an On/Off switch. All projects and services from PocketMine are provided free of charge. If you liked our project, we ask you to donate to PocketMine. 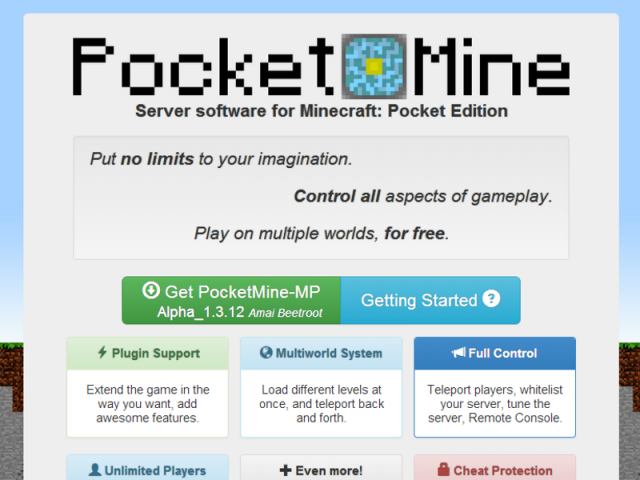 All donations will be used to cover server costs, services and software licensing, and only for PocketMine. Public donation log - How do we use donations - You can also help us develop our projects on Github.